Modern Reharmonization can be a somewhat complicated subject and it can be approached from many angles. In this blog post I want to show how some of the charts found in my books can be used to reharmonize a song, but also how this information can be used to get more use out of the things your already know or learn in the future. “Sonic Resource Guide” has a complete listing of every possible scale and its application to every chord type. “Essential Scales” shows you how to apply 22 of the most used scales to different chords in 12 keys. “Scale Analysis” shows you which scales work within a complex chord progression, the likelihood that they will show up and how to hear each scale so that you can develop your ear training skills. “Ultimate Arpeggio” takes a look at every three note chord combination. (There are only 12 possible three note chords) It then shows you the application of every three note chord through charts and also real musical examples via études. “Ultimate Three Note Chord Lexicon” takes an in depth look at each of the twelve three note combinations with études. It also includes a list of all possible chords and which of those chords can be easily played on the guitar. “52 Sweep Patterns for Guitar” gives you a list of chords in every key that these sweeps can be played over. “Trichord Sweep Pairs” shows you which chords in every key will sound good with each three note combination. “Tertial Octatonics” shows you how you can combine two “7th chords’ into an octatonic scale and every chord that these combinations work over. Let’s look deeper into why you can play a C Major Pentatonic over a “Gb7” chord. Playing a C Pentatonic scale over a “Gb7” chord works because each of the notes of the C Major Pentatonic scale are either chord tones or available tensions. The reason this works is because all of the notes of C Major Pentatonic are either chord tones or available tensions on a Gb7 chord. 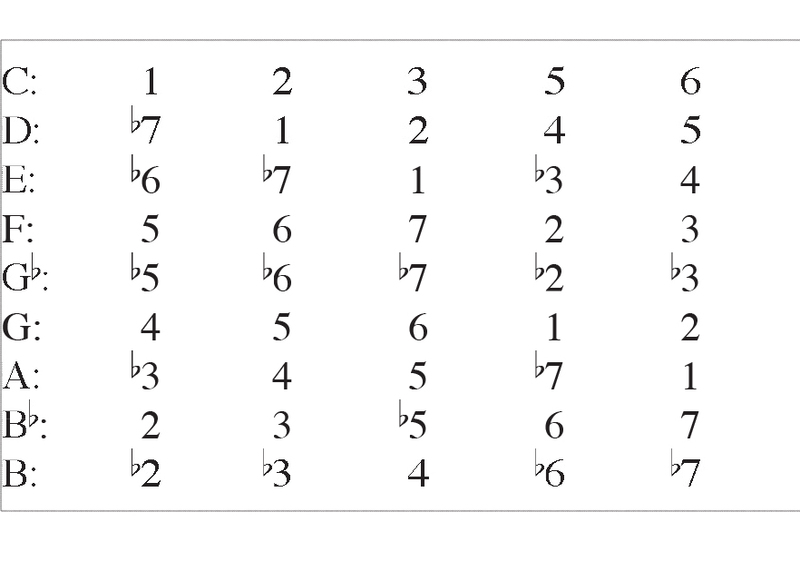 For instance: “C” = flat 5 in “Gb” is an available tension on a “7” chord, “D” = flat 6 in “Gb” is an available tension on a “7” chord, “E” = flat 7 in “Gb” is a chord tone on a “7” chord, “G” = flat 2 in “Gb” is an available tension on a “7” chord, and finally A = flat 3 in Gb is also an available tension on a “7” chord. So all of the notes of C Major Pentatonic are either chord tones or available tensions. So you can see that these Modern Rehamonization charts are very useful, and provide a quick way to apply scales to other chords or to find chords that work with a specific note. There are other ways to great modern reharmonizations which I discuss in Chord Reharmonization Overview post.